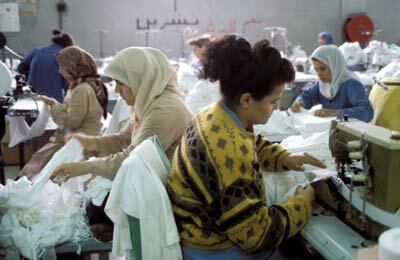 Women working in the tailoring workshop of a textile factory. Syria. This resource was compiled in response to recommendations from a 2004 Workshop hosted by the University of Michigan (UM). This workshop recommended increasing access to information and research on health needs of workers in export processing zones and factories producing for domestic consumption in low and middle income countries as well as in the newly independent states. The workshop also recommended that best practices in this field be documented and shared. This site aims to provide a comprehensive bibliography of needs assessments, research studies, policy analyses and program evaluations relevant to addressing the reproductive health needs of these workers. It seeks to include both scientific publications and the grey literature in the field. When available links to online documents are provided. The University of Michigan has worked in collaboration with El Colegio de Sonora to develop this resource. El Colegio de Sonora has a similar resource focused on literature about the Mexican Maquiladora Export Industries. We appreciate the support and sponsorship of the UM Population Studies Center and the UM Institute for Research on Women and Gender that have made this website possible. We hope that you will email us with recommendations, additional citations, and comments regarding this collection of resources.